When you sign up for PlayLine, please support Awesemo.com by using the promo code “Awesemo” and the following link: playline.com/r/Awesemo. You’ll receive a $5 bonus when you sign up and an additional $20 bonus with your first deposit. The more people we refer, the more free sponsored PlayLine content we’ll be able to offer. Please see the PlayLine website for the terms and conditions regarding their bonus. Today, we’ll be projecting the expected yards for the four quarterbacks, Patrick Mahomes, Andy Dalton, Eli Manning & Matt Ryan, in the “Awesemo.com Presents: $1,000,000 Perfect Line Bonus + $5,000GTD – The Rocket Launcher ($1,500 to 1st! )“ PlayLine contest. Your PlayLine predictions are scored according to the chart below. It’s really simple. The closer your PlayLine is to the athlete’s actual performance, the more points you get. The more points you get, the better your chances of winning! You will receive PlayLine points each time the featured athlete registers a stat that you predicted will occur. Once the athlete’s actual stat total in a particular category goes over your prediction, you will no longer receive additional per stat PlayLine points. The Kansas City Chiefs’ perfect record was snapped by Tom Brady and the New England Patriots last Sunday night in a 43-40 thriller in Foxborough. The loss stung for the Chiefs, but Patrick Mahomes continued his tear with a career-high 352 yards to his name. Mahomes has now thrown for over 300 yards in five straight games and will remain confident heading into this week’s matchup against the Cincinnati Bengals. The Bengals’ defense currently ranks in the bottom 10 in points allowed per game and bottom three in opponents’ yards per game, so they’ve certainly fielded an underwhelming defense to this point in the season. They give up an average of 292 passing yards per game, which bodes well for Mahomes and his projected performance this weekend. Additionally, the Chiefs come into the game as -6.0 favorites, with an over/under of 58.5. With that said, it should be a high-scoring affair with a ton of yards up for grabs for both teams, but the Chiefs just seem too overmatched for the Bengals to have a shot here. No rain is expected on Sunday night, which further enhances the prospects of an offensive onslaught, too. Mahomes’ projection for this week is 320-350 yards. Andy Dalton’s been a mixed bag so far this season, but he has gone for over 300 yards twice and could have an opportunity to do so against arguably the worst defense in the league. The Chiefs rank dead last in opponents’ yards per game and second to last in opponents’ passing yards per game. The Bengals aren’t a great team offensively and Dalton’s inconsistency has been an issue, but they’ve got a great opportunity to put up some points in Kansas City this week. Dalton is coming off a rough outing against the Pittsburgh Steelers last week, throwing for a season-low 229 yards. The Chiefs, as previously mentioned, come into the game as favorites and should be able to run away with this game, but that doesn’t mean Dalton can’t have himself a nice night and bounce back from a few lowly performances in recent weeks. There’s going to be plenty of gaps in the defense, so it’s just on the Bengals’ receivers to find those gaps and for Dalton to get them the ball at the right time. He could easily throw for over 300 yards this week if all goes well, but Dalton’s a risky player to bet on. We’re going to pencil him in at 270-300 yards. It’s been a struggle for the Giants so far this season, stumbling to a 1-5 record and losers of three straight games. Their offense ranks 27th in points per game and 24th in total yards per game, and that’s a big reason why they can’t add to the win column more frequently. Eli Manning has been underwhelming, throwing for over 300 yards just once to this point. He is, however, consistent and that’s what to look for when trying to predict someone’s stat line. The Giants will face-off against an Atlanta Falcons team that gives up 295.8 passing yards per game (29th) and 32.0 points per game (31st). The Falcons don’t possess a strong defense at all, and that might enable Manning and the Giants to finally let loose on offense. Atlanta comes in with a 2-4 record, so they haven’t been much better than the Giants overall, but they’re currently -5.5 favorites to win. The over/under is set at 54.5, which makes sense given the two teams’ poor defenses. The Giants will be at a disadvantage in a hostile environment, but Manning should be able to take a few shots deep down the field against the Falcons’ defense. We’re projecting him at 280-310 yards. 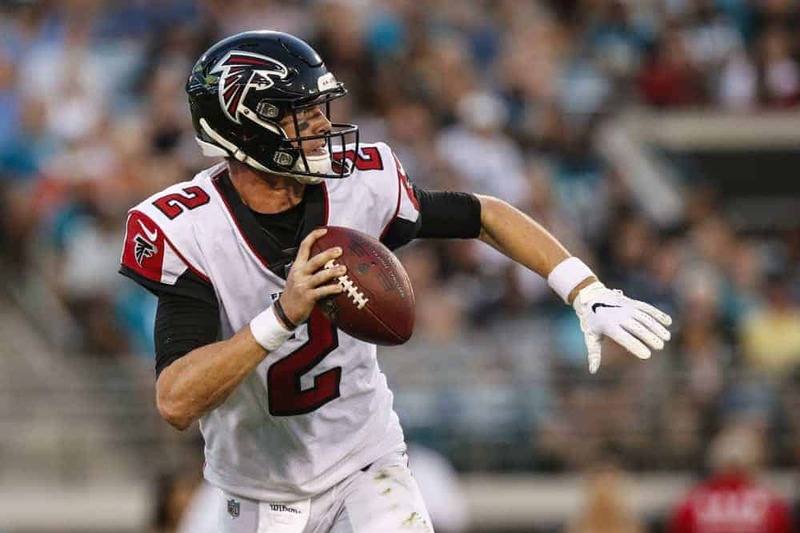 Ryan and the Falcons got back on track with a victory over the Tampa Bay Buccaneers last week, snapping a three-game losing streak. Ryan threw for 354 yards and was at his best after just 285 passing yards the previous week against the Steelers. Their opponent this week, the New York Giants, have experienced their fair share of struggles this season, but have an above-average defense that will test Ryan on Monday night. The Giants rank 10th in opponents’ passing yards per game (236.3) but are 24th in opponents’ points per game (27.0). They’ve done well against opposing quarterbacks, but Ryan is as good as they come and should be able to work around the defense in front of him. Additionally, Ryan also has homefield advantage on his side, which will be another factor to consider when projecting his passing yards for this week. Ryan’s deviation is quite significant at 66 yards, meaning week-to-week his passing yardage varies quite considerably. With all things considered, Ryan should go for between 300-340 yards.